Our Early Intervention specialist leaves sheets after every visit noting what she worked on with Penny and suggestions for us - e.g., hold two objects up near your mouth and ask Penny which she wants, using the words for them. Wednesday's note included a reference about Ned...completely unsolicited. Apparently she thinks Ned should be evaluated for speech. Alright, people, I get it! No waiting until he turns 18 months the end of February. I have a call in to discuss the EI speech program - I want to have a better handle about the services he would receive and confirm that if I am paying twice he will get separate services that are focused on language and possibly fine motor skills depending on how he tests. He seems to be comprehending more and using a few more signs so that is encouraging but his only real words are "meow" (not nearly as consistent as Penny when she sees our cat) and "that". If the EI specialist thinks he needs to be tested I'm pretty sure he'll qualify for services. I actually sent a note this week to my mom of twins listserve titled "The One Where The Mom Worries About Constant Tantrums". It was reassuring to hear from a few moms who said they've been there and this doesn't mean Ned will be hellish with tantrums his whole childhood - just for at least another 4 months. :) I'm curious where other moms go for advice? Some moms I know call the nurses line all the time but most try to speak to other moms which can be hard for me when I cannot attend the kids playgroup and music class or playdates during the week. The listserve has been invaluable in that regard. I also have a few fellow working moms with kids of similar ages although I self-indulgently feel like I have to deal with more crap from my kids then they do. Lately I have been complaining about the Juggle but allow me to put it in context with these developmental items. I always just assumed my kids would be "normal" or "above average" and it has been hard to have kids diagnosed with "failure to thrive" and "delayed". Putting the mental blow aside I want to be more involved to learn how to encourage my kids but I just can't make these meetings and groups that happen during the week. It is hard enough getting Penny to her doctor's visits - we often have to reschedule. Penny's pulminologist has been great about spending time with me on the phone but not all our specialists have been as accommodating. I'm pretty optimistic by nature so I know that it will work out and in a few years this will be a distant memory but I can see why families with kids who have special needs just cannot have two full time working parents. This is not a pity party post, I swear. I am curious if any of my readers have to deal with "special needs" and how they make it work when working. Sounds rough. I think you have wonderful perspective. I tend to get mom-advice from my church (Sunday School) friends who have kids this age. I also get feedback from the daycare teachers and parents. In find online forums tend to be too reactionary & make me worry more than necessary. Email email email. I was in a lot of different online forums to get advice from other people. Babycenter twin moms all due in June. Local moms group. Local twins group. I can't get to meetings to talk to people in person so I had to do it all online. I also think it all evens out in terms of parenting. Believe me, I used to have a lot of Poor Me moments the first 18 months. Jon was gone all the time, the kids were sick ALL THE TIME, Nate's reflux & ear infections & tubes, Alex's PT and helmet, no family in town to help. But the really beautiful thing of those terribly difficult times is now things feel like a cakewalk. They're all caught up, they are well, they've had every virus known to man, and I've managed to build a big support network. like you, I also think my kids are above average :) and that my kid problems are worse than my friends'. Confession - they actually are worse because somehow EVERYONE else's kids are sleeping right through (I need to make new friends so i can feel good again :)). Either that or they're all lying! google, online forums, family, friends. Although I do agree with what the first poster wrote about online forums, so I tend to take what is said there with a grain of salt. Two of mine started speech therapy at Christmastime (almost 22 mos old) b/c they don't say enough words although they do understand what's being said to them (i.e., they follow directions, etc). At this age, the speech therapy amounts to playing with them and sign language. Mine have picked up on the sign language relatively well, however the words are slow in coming, which makes me more and more concerned that the sign language will become more of a crutch than a bridge to actual speaking. You'll have to let me know what you think on that point if they suggest it for Ned, which I'm sure they will. FWIW - our pediatrician wasn't concerned w/ their speech until age 2. I was the one who sought out the speech therapy b/c I felt like there was a delay. The way I look at it, I'd rather clear up any problem NOW instead of later so they don't end up in "special" classes in school. I have to admit I am very lucky. I work very closely with two moms that have their own set of boy-boy twins. Both of them have different issues with each of their boys. One set of twins is 4 years old and the other is 5 years old, so they have been there for awhile and have lots of advice. Both helped coordinate my work baby shower and it was awesome! They knew what I'd need. I'm so grateful to have these two ladies in my life, because even though I have a 9-year-old daughter a lot of this stuff is nothing I ever had to deal with before. Don't sweat the delays. I mean, I think you're doing the right thing getting help, but at this age, it's not worrying, especially if they're not global delays (i.e., if you were experiencing delays in ALL areas, that's more concerning than just a speech delay, or just a motor delay, etc.) Even then, the kids are still really young, and falling on the slower end of the development scale at this age doesn't mean they'll always be on the slower end. Getting them extra help now might be just what they need to get them into the "normal" or "above average" categories. Also, everyone has strengths and weaknesses. Think about yourself, your siblings, your husband. I'm sure you all have things you're good and not good at. It's so much harder with kids, when you see something they're not good at! I worry my kids will get teased for those things! But I try to ease up with my fears...sure, I work with them on those areas, but I also try to remember that it's okay if they're never superstars at everything. I have several friends who have kids close to the same age as my girls, but by all accounts they are angel babies, so not very helpful. I rely heavily on my local twins club forums and reading other blogs make me feel less alone in my mothering. I've been very lucky in that my current job allows me to go to appointments, stay home with sick kids, etc. Now that I'm looking for a new position, my wish list was pretty lame - benefits, salary of X and flexibility. Some people want to have purpose, save the world, etc. and I'm like really, I just need to leave at 5 p.m. please. We will see if I can make that all happen. "Back in the day," we were told to expect twins to be speech-delayed. And boy, mine really were! Our firstborn was a verbal overachiever, which made us notice this even more. My observation was that the twins seemed to need language less than their older sibling did (due to 'twin-speak'). They understood everything quite well, and they spoke when they were good and ready. And have yet to stop talking, 21 years later. I hate to hear you stressing out about speech so early. Mine really didn't start speaking in earnest until age 2. When someone advises you that "they'll grow out of it," even though you might feel that they are blowing you off, consider that they might actually be right! Gavin was in Occupational Therapy from 3 months old on for multiple issues, a BIG one being his temperment (constant tantrums, raging, and inability to self-soothe). He's a smart kid and has scored high on their cognitive and receptive language tests, but very low on communication and speech. Basically, he was taking in tons of information and understood a lot of what was being said to him from early on, but he wasn't able to communicate. The theory was that the tantrums were due to frustration because he had all of this stuff in his head that he couldn't get out. At 18 months, he MAYBE had 2 words and 5 signs. At 2 years he had about 10 words. Then, the explosion happened.....by 26 months he had probably 200 words. And guess what? The tantrums FINALLY stopped....or at least changed to a normal 2 year old level. He did start speech therapy, but by then the speech explosion had already happened. Now, Emery is being evaluated for speech therapy. Gavin is talking circles around her! He has a huge vocabulary and is our little chatterbox. So, I guess what I'm getting at is that the speech may be related to the tantrums. At least it was in our case. It's amazing how much happier Gavin seems since he started talking. I have a child who had delayed speech, ADHD, and possibly Asperger's Syndrome. I too struggled with the huge emotional blow that my child was not perfect in every way. My husband and I both work and at least twice a year, my husband is overseas and I am playing single working mom. Although I do not have twins, in addition to my 6 year old I also have a three year old. The last year or two have been really trying, if not heartbreaking. I can honestly say I have toyed with the idea of throwing away my very promising, highly lucrative career to stay at home. Juggling psychiatrists, therapists, and speech therapy is exhausting. I am very lucky to have supervisors who value family above all else so I am able to work at home and/or work a flexible schedule when needed. I leaned very hard on my parents and on a message board of mommies from all over the country. One or two of them actually had some similar experiences. And, I found with our therapist that although she is Andrew's therapist, she is always there for me to help when I feel like all else is hopeless. I also have friends who let me vent whenever I need. Good luck. You are a great mommy. 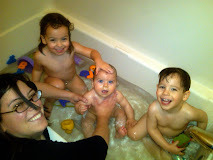 The fact that you are able to provide your children with a Nanny that gives them lots of needed attention is fabulous. That alone will help more than you know.